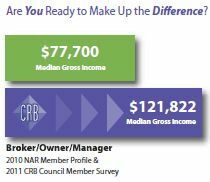 The median gross personal income of a CRB Designee is 57% MORE than their REALTOR® colleagues without the Designation. most respected and relevant designations offered in real estate business management. There are approximately 7,000 CRB members worldwide. Through the Council’s leading-edge education and resources, members are among the most efficient, effective and profitable managers in the country. The CRB designation signifies a person who has taken the extra time to educate themselves through the CRB program and has achieved a significant level of brokerage management experience. The most successful brokerages are owned or managed by professionals having the prestigious CRB designation after their names. Start on the path to earning your CRB designation today. Hawaii members must retain membership with National CRB prior to joining our chapter and maintain membership at both levels. Candidates are individuals actively pursuing the CRB Designation. Designee members have obtained the CRB designation. Individuals who are not pursuing the CRB designation but who desire membership in the Hawaii CRB Chapter may become affiliate members and enjoy all rights and privileges of membership except the right to vote and hold office.